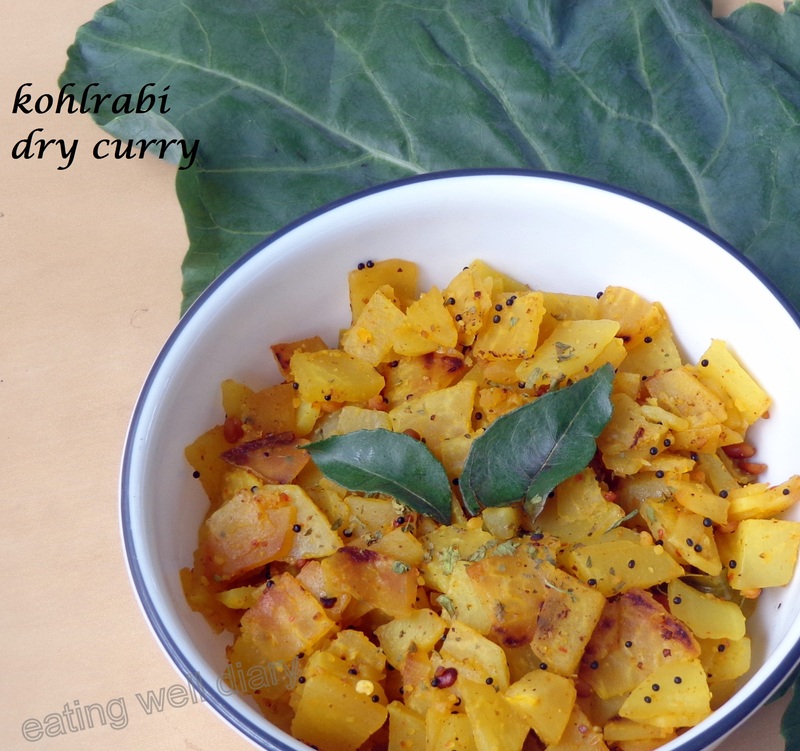 Home / side dish / Growing Kohlrabi/ noolkol in the garden and curry made two ways! 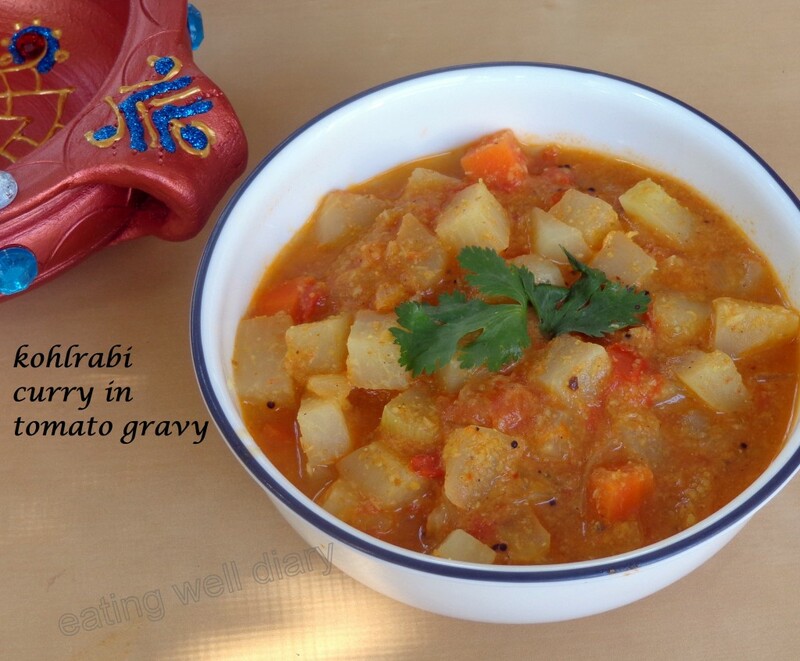 Growing Kohlrabi/ noolkol in the garden and curry made two ways! I was able to successfully grow kohlrabi in my garden this year! 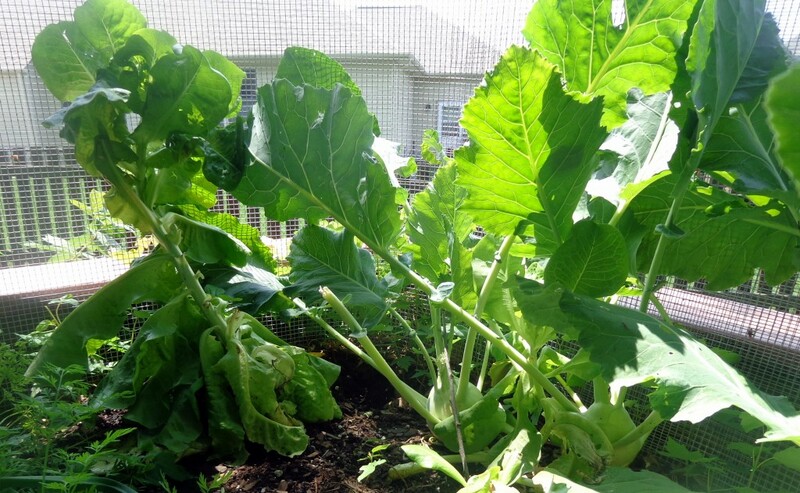 It is one of the easiest vegetables to grow, provided you have made the area rabbit-proof. I used a gardening tip and planted a row of lettuce as a companion right next to it. They grew pretty tall and yielded nice bulbs. Luckily, only one (out of 12) was attacked by a caterpillar-like pest. I harvested them before they got very woody and it was perfect and tender without too much fiber. Kohlrabi is considered one of the healthiest vegetables, high in vitamins B, C and minerals potassium, copper, manganese. Bringing these dishes to the virtual blogger’s party, Fiesta Friday #23, over at Angie’s blog, The Novice Gardener. Thank you Angie and this week’s co-hosts! This is also my entry into the Virtual Vegan Potluck at An Unrefined Vegan. Do check out the links for awesome recipes from other bloggers! In this picture you see butter leaf lettuce on the left and kohlrabi on the right. 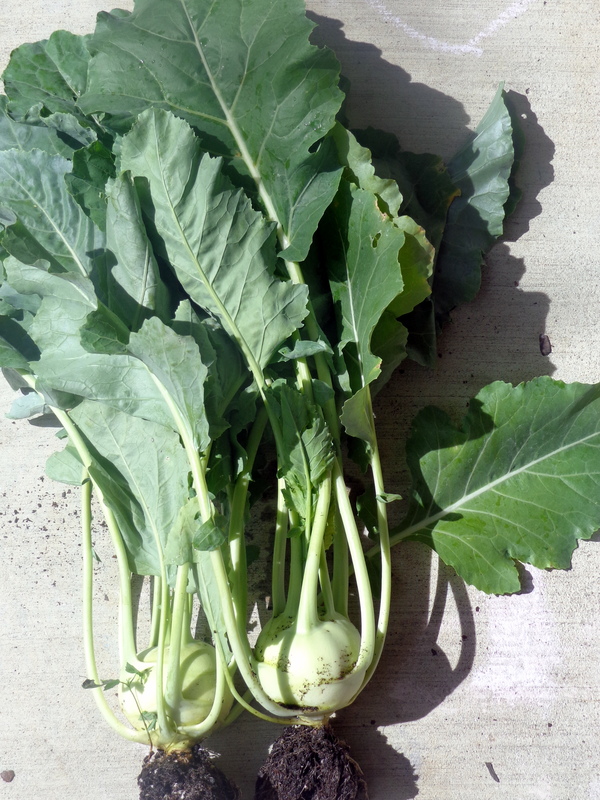 The whole kohlrabi plant is taken out; the root is removed and tender leaves can be stored and used in other recipes. 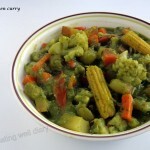 I present two delicious curries of this nutrient-rich vegetable. One is a simple saatvik dry side dish that I learned to make from my mother-in-law. The other is adapted from my blogger friend Namrata of My Food Tapestry. I have adapted her recipe for mixed vegetable dish and used kohlrabi almost exclusively. The vegetable is roughly peeled and cut into thin slices like this. Cooking with Indian spices, simple as that! urad dal/black gram- 1 tsp. 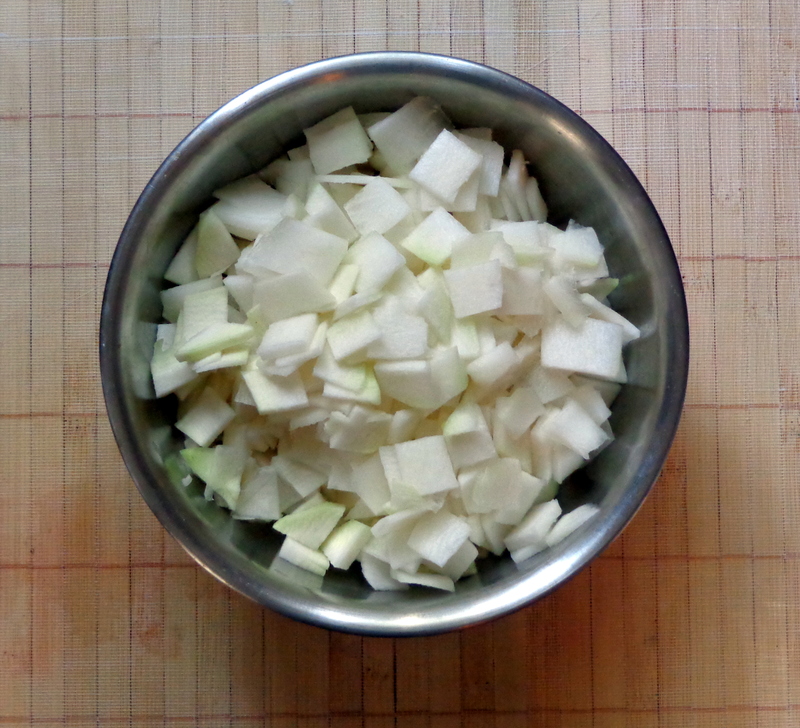 * Cut washed kohlrabi into thin slices. * Heat oil in shallow pan, add mustard seeds, asafoetida and urad dal. When seeds splutter, add curry leaves and kohlrabi. 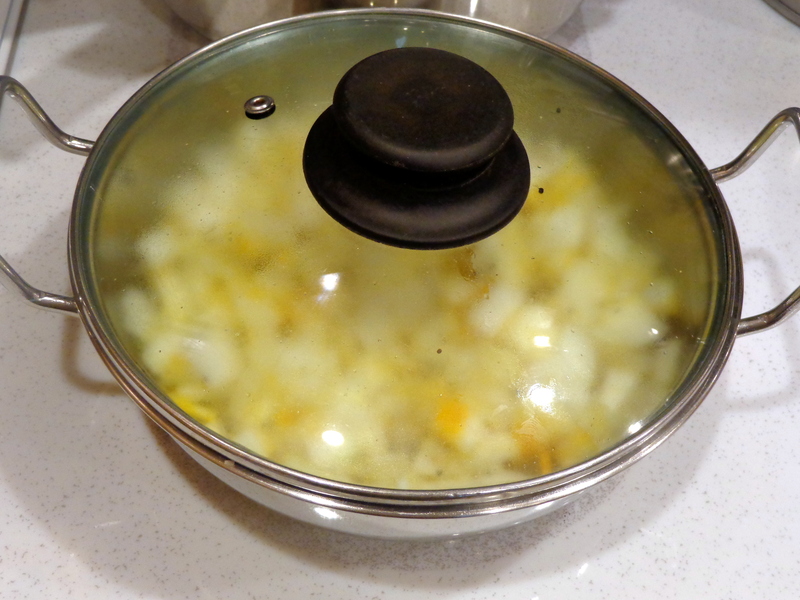 Add salt, turmeric powder and cook with lid on. * When the vegetable is soft, add the other spices and blend well. 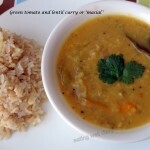 Serve warm with rice and lentil rasam/sambar. Or just eat it plain, it is yummy! coriander seeds- 1 1/2 tbsp. * Dice kohlrabi and carrots. Prepare the spice mix by dry roasting all the ingredients except coconut. Then cool and grind along with coconut in a spice grinder. * Steam kohlrabi and carrots in a separate pan till tender. Add required amount of salt. * Meanwhile, heat oil in a shallow pan. Add mustard seeds and asafoetida. When the seeds splutter, add onion, turmeric powder. * Add chopped tomatoes, salt and cook till gravy forms. Add cooked vegetable, spice mix and blend well on low heat. 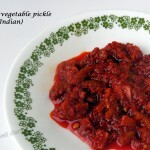 * Serve with Indian flat bread or rice. 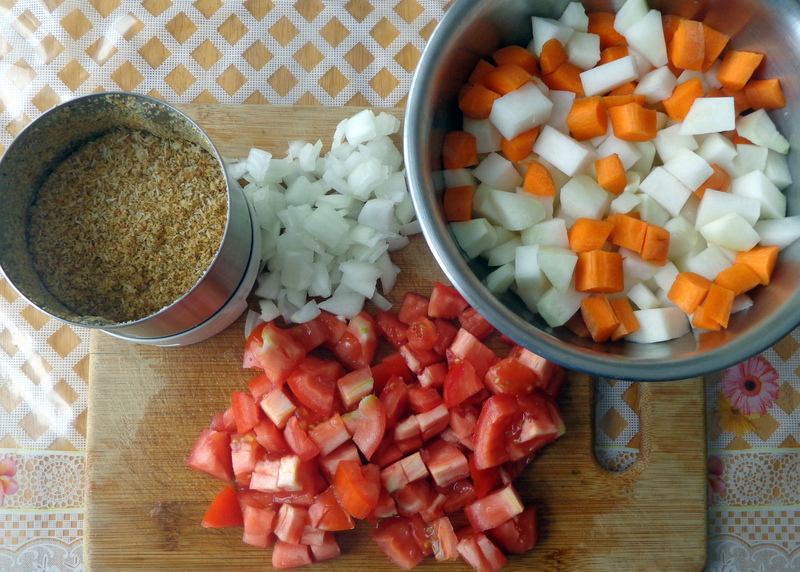 42 thoughts on : Growing Kohlrabi/ noolkol in the garden and curry made two ways! That’s wonderful that you were able to successfully grow it! 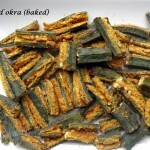 Thank you for the shout out Apsara:-) like the dry dish, will try it soon! I love love love Kholrabi !!! It’s not in season here right now but I cook a ton of it in the fall and winter. Thank you for this yummy recipe! Thank you, I’m glad you like it, Sue. It must be so satisfying cooking greens that you’ve grown yourself? Great job! I’ve never tried growing kohlrabi is it similar to turnips? I believe it is. It belongs to the cabbage and turnip family. You should be very proud of your green thumb, look at those vegetables!!! I agree with Loretta, it must be very satisfying cooking with your own vegetables! Thanks for bring this to FF! It has taken me a few years to find my green thumb, Margy. I hope I keep it. 🙂 I’m glad you like these! that’s a nice way to have the greens. I will try it, thanks Lauzan! Thank you, Sylvia. I discovered my own green thumb recently. Maybe you will too, someday. 🙂 Thank you for co-hosting this FF. I am a big kohlrabi lover & so is my hubby & I am happy to hav extra recipes using this tasty vegg8 Yummm! thanks, Petra. I do not eat it raw because it is goitrogenic- not good for people with low thyroid. Hi Apsara, I have never tried kohl rabi before I have to admit. But will give it a try now. Is it pretty easy to grow too? It surely is. I’m truly a ‘novice’ gardener and found it easy! Too good Apsara, that’s great that you grew it!! Recipe looks fantastic…. If only I had these recipes last year when I grew kohlrabi. If you haven’t tried it, give the variety called “Kossak” a try. It’ll grow to the size of a soccer ball, I’m not kidding! So, imagine a dozen or so of those balls in my kitchen. Can you blame me for scratching it off my list of plants to grow this year? 🙂 But I should give it another chance now that I’m armed with your recipes. 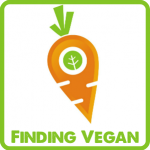 Thanks for sharing at FF, Apsara! I really like kohlrabi, but had no idea how to use it – thanks for this! And thanks for sharing your recipe with the first weekly Potluck. Thank you for the opportunity and the help in linking it! I’m glad you like the recipes. Wow, Apsara! I’m so jealous of your homegrown kohlrabi. I really enjoy this root vegetable in salads and am digging your kohlrabi dishes. Love it! Thanks for sharing! You’re welcome, Ngan. Glad you like it!